Today I made a third feature block for my Gypsy Wife quilt. I’m following our quilt-along schedule, so I’ve made From the Heart this week. It’s a sweet 6” finished block showcasing a string of hourglass blocks within a heart. This block belongs to the blue section of my Gypsy Wife quilt, which I’m creating as a rainbow blend. I didn’t have any Anna Maria Horner fabrics that suited this block in true blue. Apparently she does a lot of more turquoise to aqua blues (or those are the ones I buy!). But I’m happy with this Rifle Paper Fabric tiny floral print and the Cotton & Steel sprinkle. Choose fabrics for this block that aren’t strongly directional. To keep the sewing simple and avoid making extra scraps, I allowed my floral print to appear tossed. If you’re making your hourglass blocks via the popular two-to-a-batch method, you’ll want to cut those initial fabric squares as 3.5” and trim them to 2.5”. A 2.5” ruler will help you keep the hourglass shape centered with the diagonal seams extending to each block corner. Save the extra hourglass block for your filler blocks! The top of the block has two heart peaks. When cutting the heart fabric strips for this section, add an extra 1/8” to the length. I cut mine the 3.5” directed and was not able to avoid loosing some length in the sewing process. Starting with a 3 5/8” length would have worked perfectly. Have you discovered the Gemini Build-A-Block™ Patchwork System? Whether you’re new to quilting and patchwork or a seasoned pro, Build-A-Block™ dies make it easy to design, cut and create a whole variety of quilt block designs in a range of sizes! 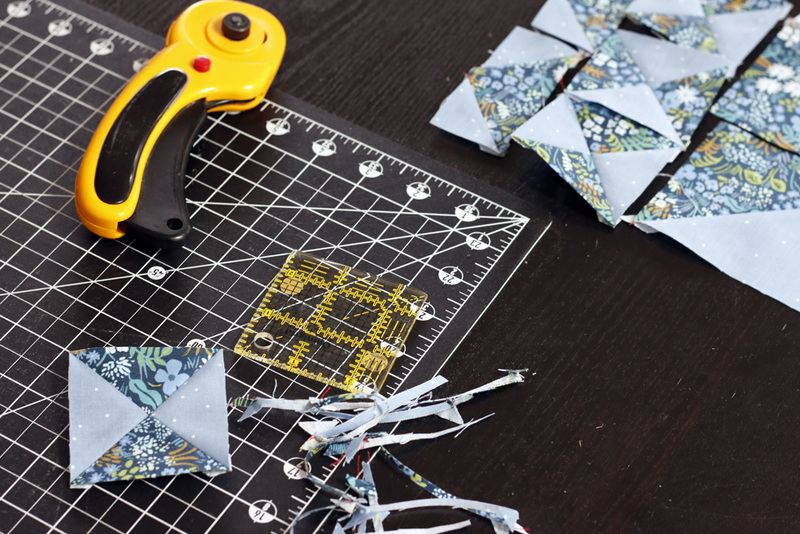 They cut through multiple layers of fabric with accuracy so you can focus on the fun parts of your quilting and patchwork projects. To prevent end-of-project burnout, I’m making a big batch of filler blocks each month. These blocks are technically assigned to certain weeks in April, but if you follow that schedule it’s a lot more sewing in April than in other months. Besides, it’s fun to jump ahead and start seeing my quilt’s story come to life. For January I started on the 3.5” and 4.5” unfinished square-in-square blocks. Rather than following the pattern directions, I’m using Hydee Ann’s alternate method for sewing the 3.5" blocks and 4.5" blocks. This method creates a slightly over-sized block that is trimmed down to size once complete. For most people this yields much better results, so I highly recommend it! The filler blocks are a great place to use scraps! I’ve been even able to use triangular scraps for the square surrounds, which is like the holy grail of scrap sewing, in my opinion. I’m putting a bit of AMH fabric in most every block. It’s fun to have a theme, but not be chained to it. Using her fabrics is a great starting place, but my rainbow blend layout is the real guide. Here they are up on my design wall. Clearly, we have a lot more sewing to do! But I’m glad. This has been a fun project so far, and I’m eager to continue. I hope you’ve been enjoying it as well, whether you are sewing or following along!